This product was sent to me for my consideration. I’m guessing that this product became a thing after the whole Nivea-Aftershave-Balm-As-A-Primer craze. I personally haven’t tried out that hack for myself, but after using this product, I can see why it became so popular. The Nivea 2-in-1 Moisturizing Primer has quickly become one of my favourite moisturizers to use, especially under makeup. It leaves my skin feeling so soft and smooth, creating a perfect base for any product I decide to add on top of it. I use the formula for dry and sensitive skin, but there is also a formula for normal skin types. I was a little hesitant while trying this product for the first time because during the summer, my skin gets much more oily. Surprisingly, I didn’t find that this product made my skin any greasier. It made my skin feel perfectly moisturized, and it also kept it more matte. I highly recommend this product to anyone with combination skin, and the fact that it is only $10.95 CAD sweetens the deal a little more. This product has been a part of my routine for what feels like an eternity (more like 4 years). I always venture out and try to find other alternatives, but I keep coming back to this guy. Why? Because it just gets the job done without any fuss. If you have combination to oily skin and you just want a simple moisturizer that is easy to use and feels good on the skin while also keeping your oil in check, look no further. This moisturizer is also amazing for those with sensitive skin given that it doesn’t have any added fragrance, but it still has a pleasant scent. The texture of this product is lovely and I always enjoy using it. It’s a bit on the pricier side, about $34 CAD, however you get a big bottle of product which lasts a good while and it also comes with a pump, making it more hygienic to use. I’m so happy that MAC decided to expand their Strobe Cream line to include different undertones. The Goldlite version does such a great job at giving the skin a beautiful and subtle glow. It reflects gold unlike the original Strobe Cream which reflects pink. The consistency of the Strobe Cream is also very nice. It provides hydration but it also works well for those with combination skin in the summer months as well. It doesn’t make my skin feel greasy, and while it doesn’t exactly mattify either, it gives the skin a nice luminescence. The Strobe Cream is the most expensive product in this list at $40 CAD, which I think is quite steep, however I haven’t been able to find any suitable dupes. I’m open to any recommendations! 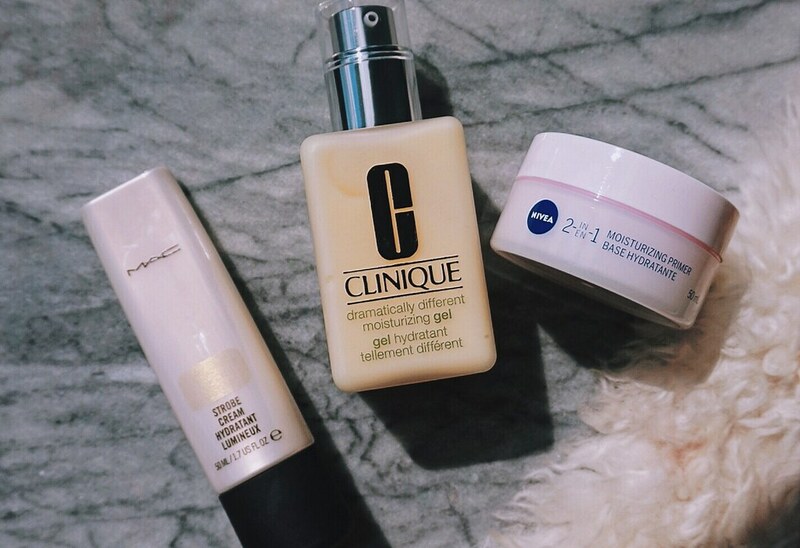 What is your favourite summer moisturizer? Note: The Nivea 2-in-1 Moisturizing Primer was received as a complimentary item for my consideration. In addition, I was not required to write a review on this product. I also did not receive any compensation for this review.